Some 75,000 Syrian refugees trapped on the border with Jordan received emergency food supplies on Aug. 4 from UN aid agencies. Heads of the World Food Program, the United Nations High Commissioner for Refugees, the children’s agency UNICEF and the International Organization for Migration said the delivery of the food and “humanitarian items” was the first since June, when Jordan closed its border with Syria after a suicide bombing claimed by Islamic State of Iraq and Levant (ISIL) killed seven soldiers. Jordan, which already hosts hundreds of thousands of Syrian refugees, agreed in July to a one-off aid delivery for those trapped on its border after an appeal by the United Nations. “Unable either to cross the border or turn back, the situation facing these women, men and children has grown more dire by the day,” the UN agencies said. The agencies stressed that health care was “urgently” needed for the refugees, “particularly for pregnant women, children and other vulnerable groups such as the elderly and the sick” trapped along the border. 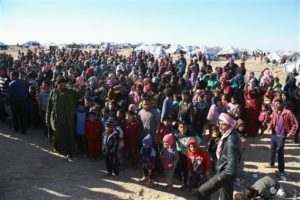 “We look forward to further efforts to reach people at the berm with humanitarian assistance in time to save their lives,” they said, thanking the Jordanian government for its cooperation. Several international aid and rights groups have urged Jordan to revoke its June decision and keep its borders open to refugees fleeing Syria’s five-year war.